The more I think about it, the more I like the idea of policy drift as a way to explain what might at times seem like perverse outcomes in the international tax system. This post is an attempt to road test this idea. Policy drift seems to originate with this 2004 article by Jacob Hacker [pdf], which was then magnified by the seminal book he co-authored, Winner Take All Politics. It starts from two powerful insights. First: it is much easier for interest groups to defend the status quo than it is for them to change it. Second: if a policy does not adapt in response to changes in the economic or social world, then its effects may change. Combined, these insights show the effects of a policy may change over time because it is too difficult to make the changes needed to adapt it to changing circumstances. Policy drift is said to happen when it is hard to make formal and informal changes to a policy. There are two other concepts in the same literature that are worth considering. Where it is hard to make formal changes to a policy, but easy to ‘convert’ it by reinterpreting it, there can be an internal adaptation of a policy. Where it is easier to make formal changes but harder to convert existing policies, the outcome may be ‘layering’, in which a new policy is implemented on top of an existing one. Let’s consider three taxation examples. It’s 1991, and the UK government introduces a new tax to fund local council services. It is based on house prices, valuing every property in the country and putting it within eight price bands. 24 years later, all properties are still placed in a band based on an estimate of what their value would have been in 1991. There are many arguments for and against this approach, but you can make the case that it achieved a form of horizontal and vertical equity when it was introduced, especially compare with what it replaced. But over those 24 years, the value of properties has not changed equally in different areas. People living in London, for example, where prices have risen much faster than the UK average, do very well out of a system that is based on what their property was worth in 1991. Successive governments have recognised this, but feared the electoral consequences of a reform that would increase the council tax charges of a large number of people. It seems that an internal conversion – revaluation of properties – is a harder thing to achieve than a formal layering – the introduction of a new tax on the most valuable properties, which was proposed by some parties at the election just gone. Absent both, the policy has drifted, from a broadly progressive tax on property towards one that is flat at the higher levels. It’s 1970, and the government of a recently independent developing country wants to attract foreign investors, who will bring with them much needed capital and technical expertise. It offers them generous tax incentives, but it finds that these incentives are frustrated by the foreign tax credit system of the investors’ home country: the investor pays less tax in the developing country, but this just means they pay more tax in their home country instead. So the two countries conclude a tax treaty. The treaty requires the developed country to grant ‘matching credits’ so that firms can keep the benefits of any tax incentives, but in return the developing country must lower its withholding tax rates on dividends remitted by investors from the treaty partner. These lower rates transfer the burden of double taxation relief away from the developed country, which would otherwise have paid for it through its foreign tax credit, onto the developing country. Maybe that was a fair deal, maybe it wasn’t. Now it’s 2014, and most developed countries have moved from a foreign tax credit system to a dividend exemption. The tax sparing credits are no longer necessary, because the developed country doesn’t tax its outward investors’ foreign profits. Meanwhile the lower dividend withholding tax rates no longer shift the burden of double tax relief from the devloped to the developing country, since the developed country has foregone the revenue either way. So now the agreement serves a very different function: it makes it cheaper for the investor to repatriate profits from the developing country, an effect that is paid for by the developing country. It distorts the market for inward investment by treating investors from this one country differently, and it might have become a conduit through which investors from third countries divert their investments to obtain the more generous treaty. Maybe these present day effects are good for the developing country, or maybe they aren’t. But the policy has drifted, because the treaty certainly has very different effects from those intended when it was signed; furthemore, the original bargain between the two countries is no longer relevant, and the distribution of the costs and benefits between the two partners may have changed dramatically. There could perhaps be an internal conversion, by chosing to interpet the treaty in certain ways, but this would be difficult; formal change is tricky too, because it requires cancellation or renegotiation of the treaty, which might scare investors, and because if one country loses out from the shift in costs and benefits, the other country generally has no incentive to renegotiate! For much of the 20th century, government representatives and technical experts sat in rooms developing the component parts of the international tax system. Let’s simplify and say that the purpose of this exercise was to reach a situation in which multinational companies’ tax bases were distributed among the countries in which they operated according to the contribution their operations in each country made to their overall profits. The deal was reached at a time when, broadly speaking, you needed a physical presence in a country to do that. (The arguments made for a withholding tax on management fees in the 1970s tended to be about preventing tax avoidance, not fair distribution of taxing rights). So the concepts and tools developed in the past all require some kind of physical presence. In the 21st century, it’s become apparent that a physical presence is no longer a prerequisite for significant value-added in a country. So the system does not achieve this original purpose. Instead, it gives an advantage to those countries that are home to the physical establishments of businesses that generate a lot of value in other countries without one. Arguably, the source/residence balance has shifted in favour of residence countries. Certainly, the policy has drifted. The OECD’s desire not to open up the source/residence discussion during its BEPS process illustrates the difficulty in achieving any formal change in these existing policies. That China and India have been attempting to re-interpret the core concepts that they’ve already signed up to, including through changes in the commentary to the UN model treaty, suggests that there may be some internal conversion afoot. In any event, I think these concepts of drift, conversion and layering – and especially drift – are quite helpful in understanding the path-dependent development of national and international tax systems. There are, of course, proposals to rebuild both from the ground up. But such proposals need to take into account the political constraints and the economic and social developments that have moulded the status quo. 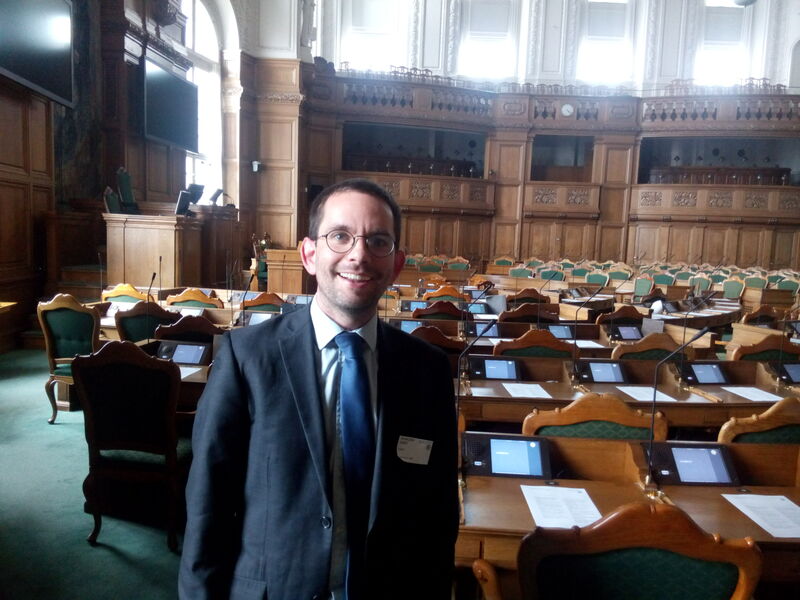 At the risk of turning this into a travel blog, here I am in Denmark’s parliament building, the Borgen, a treat for aficionados of the TV programme. I spoke yesterday at a hearing organised by the parliament’s fiscal affairs committee on Denmark’s tax treaties with developing countries. The hearing was provoked by ActionAid Denmark’s questioning of the Denmark-Ghana tax treaty, which was ratified recently by the Danish parliament. The British Public Accounts Committee this was not, and there was some good natured discussion between the different sides. Everyone agreed that businesses prefer there to be more tax treaties in place. The MPs, business and NGO representatives all agreed that there should be more transparency in the negotiation process. We all agreed that having a treaty might improve the prospect of Danish investment into a developing country. Denmark’s tax minister and the industry representatives all said that a key consideration – perhaps the main consideration – for Danish treaty policy was to help make Danish companies competitive in the markets in which they invest. All of these arguments fell short, in my view, of establishing a clear cut, generalisable and evidence-based case that this is to the benefit of developing countries themselves. Clarifying definitions, providing dispute resolution, and other technical matters that make double taxation less likely. Giving tax authorities the legal basis for cooperation in enforcement matters. Offering businesses the reassurance of a credible commitment to fair and ‘civilised’ (not my word) tax treatment in the future. Reducing the taxing rights of the developing (ie source) country. The case that treaties are necessary to provide items 1, 2 and perhaps 3 is strong. There is a (debatable) economic case for reducing source taxation to attract investment, made well by Clive Baxter from Maersk yesterday. But why respond to that case through bilateral treaties, which are harder to alter if the facts change, and which distort the inward investment market by treating investors from different countries differently? Why should the quid pro quo for items 1-3 be item 4? The fallacy, it seems to me, is to conflate the case for cooperation through treaties with the case for lower source taxation. Here is my presentation. I’ll update this post when the others are all online, but they will only be of use to Danish speakers! Have the source and residence principles become redundant? How typical. You only just get your head round a concept that you learn it’s no longer useful. So it seems to be with the principles of source and residence, based on a thought-provoking conference at the Oxford Centre for Business Taxation last week. To recap. The fundamental problem of international tax is to allocate between countries the right to tax income earned in one country by a company or person who is a resident of another. Under the source principle, the income is taxed where it arises, for example the country in which a road is built; under the residence principle, it’s taxed where the person earning the income resides, for example the home country of the road building company. This is lecture 1 in any international tax course, and it’s still the basis on which tax treaties divide up taxing rights. I’m interested in it because, in general, developing countries are “source countries” – investees – and developed countries are “residence countries” – investors. I would already have said that tax havens confound this categorisation, because they’re often neither the country of source nor residence, but rather somewhere off to the side that allowing exploits the definitions of source and residence while actually being neither. But it seems there are at least two more ways in which the source/residence distinction doesn’t work any more, according to some of the speakers. 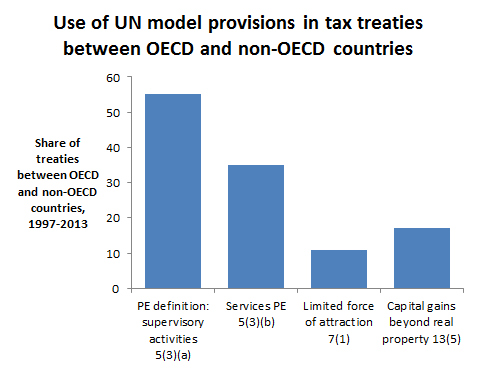 Where should tax fit into the post-2015 development settlement? 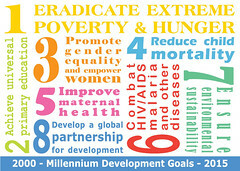 As readers from development agencies will know, a huge and complex process is currently underway to develop a new set of global ordering principles for international development, to replace the Millenium Development Goals, which expire in 2015. Over the weekend I was happy to be able to attend a conference organised by the United Nations Development Programme, which brought together mostly African activists and academics to discuss the thorny question of financing this agenda. It was held at the Pan-African Parliament, a strange place that looks like a high security warehouse just outside of Johannesburg.